The Design Miami/ 2009 Tent takes standard tent fabrication and turns it on its side. The walls are formed in the same manner as a tent roof, sliding fabric panels into the tracks of the structure. By doing this horizontally on the facade, the entire building is wrapped in only four stripes of vinyl. Standard tent fabrication becomes an architectural statement instead of something to hide. In addition to being quick and easy to build (a lesson learned from having done it once before) the building wrap creates a monumental presence on the street. 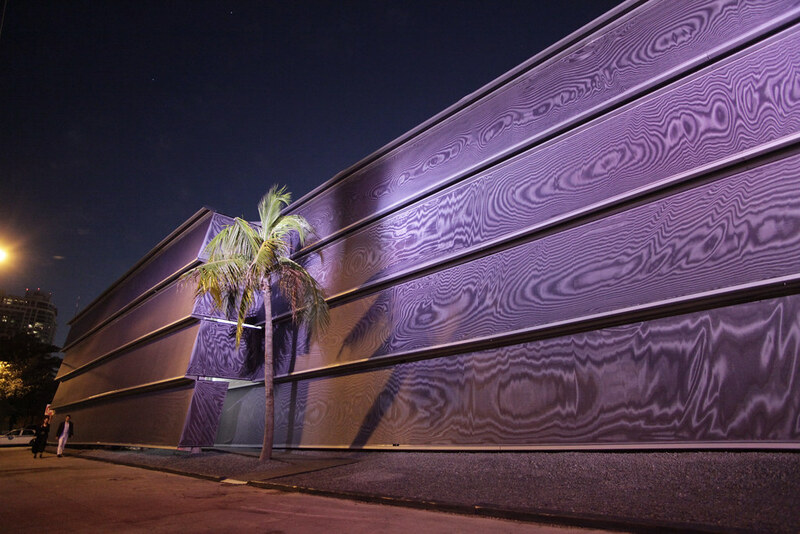 Animating the horizontal strips is a moire pattern that changes from day to night. The moire pattern is created by the layering of a simple mesh and its own shadow onto the white vinyl backing.